When the San Francisco Giants made the decision to build a new, privately financed downtown stadium to replace venerable Candlestick Park, its plans included highly visible honors to its two most beloved players “Say Hey” Willie Mays and “Willie Mac” McCovey. 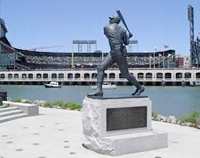 On April 11, 2000, the Giants played their first regular season baseball game at Pacific Bell Park, later renamed SBC Park and then in February 2006 AT&T Park, which sits on the shores of China Basin (a.k.a. McCovey Cove by Giants fans) at the corner of 3rd and King Streets (affectionately dubbed 24 Willie Mays Plaza). As fans approach the ballpark they see a magnificent steel and brick structure with is a statue of 600 Home Run Club member Willie Mays (660 career homers) manning the main entrance gate. 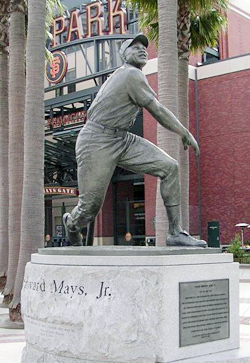 “I'm having a statue built while I'm alive to see it, and I think it's tremendous," Mays said. There are no seats behind the right field wall because of McCovey Cove, part of the San Francisco Bay. However, there is enough room that fans can walk behind the right field wall and see through the screened and brick right field fence. And it is there that fans can enjoy a fitting tribute to perhaps the most beloved San Francisco Giants player of all, #44 Willie McCovey. The larger-than-life image of this living legend has been carved in bronze and placed as the centerpiece of McCovey Point at China Basin Park, the arrival point for the throng of ferries, boats, canoes and rafts that make the Cove home on game days; and a popular pre- and post-game gathering spot for Giants fans young and old. Visible from inside the ballpark, the McCovey statue is illuminated at night, shining like a beacon into the present from the Giants' treasured seasons of the past. "It's going to be nice to sit in my (luxury) box, look over here and enjoy this beautiful park with all the kids hitting off the tee," said “Stretch” McCovey, a member of the 500 Home Run Club with 521 career homers. "It's not so bad to look at my statue, either." Somebody asked McCovey why his statue was bigger than Mays' statue. "Have you ever seen us side by side?" McCovey said. "I'm taller."